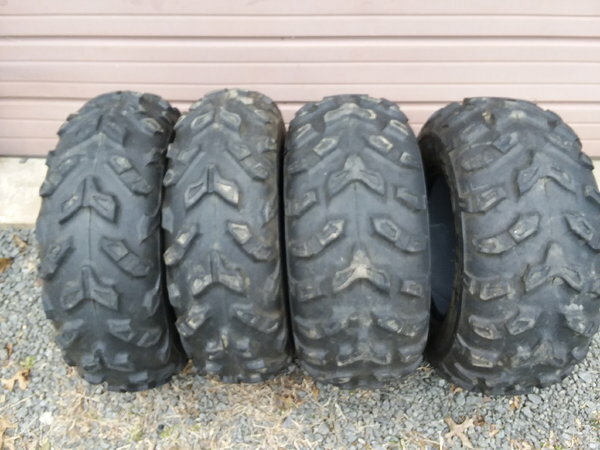 Complete set of (4) used factory Maxxis ATV & UTV Tires. These were factory installed OEM tires on all Yamaha 4X4 Rhino's from 2004 to 2013. These will work on any 4X4 UTV and 4X4 ATV with factory style stagger'd 12 inch wheels. These are not perfect brand new looking tires, but overall in good condition with a good bit of tread left, I would guess they are about 75% to 80% left. No leaks, no holes, no plugs, no dry rot. Sold as a set of 4 only.